“…Some people say about human beings, Dust to dust. Every now and then, I read a poem at the end of the yoga classes I teach, just as people start to get settled in savasana/final relaxation. I often seek poems that follow a theme that seems appropriate for the day. Such themes can relate to weather, season, local events or just some idea that seemed poignant to me. Invariably I don’t find a poem via this method, perhaps as most of the poetry I have at home just doesn’t match up (I own too much lusty Neruda or angry Snyder and Giovanni, I suppose). If I’m still resolute on finding some painted words to share, I open up one of my two books of Rumi poetry and more often than not, I find something that I just adore. Above is an except from a poem that seemed perfect for springtime – when perceived dormancy outside disappears and suddenly there is a circus in the yard and neighborhood. It’s not a change from what was not here, to what is now here – but just a revealing of something hidden from view. So many things are more complex and beautiful than they look in just one glance. 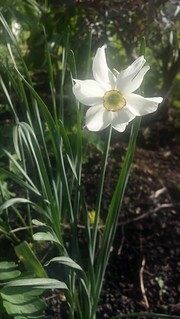 Wouldn’t it be fascinating to be able to see what’s going on in narcissus bulbs, when the bloom isn’t happening? To see a tree getting ready to sent out leaves? To see things really start moving & cooking in the composter? Everything would need to turn semi-transparent, or half of everything would need to get power-washed away. It would be an exciting view, but perhaps not so restful as a long, wrapped-up and dark winter. There are six days until we can safely plant the tomato seedlings outside. And, our very first poppy is cooking up quite a bud. *From Rumi. “Harvest.” Rumi: Bridge to the Soul: Journeys into the Music and Silence of the Heart. Trans. Coleman Barks. New York: HarperCollins, 2007. Print.